Marketplace Origination volumes in Continental Europe saw a slight month on month drop in May with €52.45m of loans originated, down from €56.6m in April. However, the sector still posted an impressive 125% growth on the same period last year and has not seen the pull back in volume growth that the UK industry has seen. Perhaps this is due to less institutional involvement in the more nascent European market? The slide vs April was caused by a fall in origination in the business lending segment with volume down €5.3m. Funding Circle Continental Europe, the largest business lender, had its slowest month since July 2015 - before it became part of Funding Circle. The platform originated €3.6m over the month, significantly lower than the €10.2m high seen in February of this year. 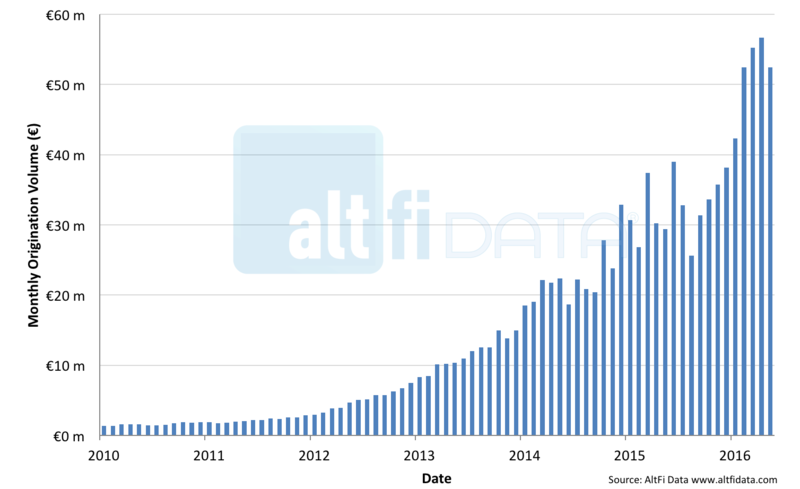 Finexkap, on the other hand, posted a record month with €4.7m of origination. This betters their previous biggest month by almost €1.5m and makes it their fourth consecutive month of growth. 6 of the 24 platforms within the Continental European Liberum AltFi Volume Index posted new records in the month of May.